Banks and other financial institutions offer several advanced banking services with an aim to satisfy the customers with convenient banking services. SMS Alerts is one of the advanced and convenient services. The customers get instant alerts on withdrawal and deposits as well as cheque clearance. SMS alerts service keep the customers updated with their bank account. Every account holder must activate the SMS Alerts service providing a permanent mobile number. You can either visit the branch or make a request online to activate the SMS alerts. 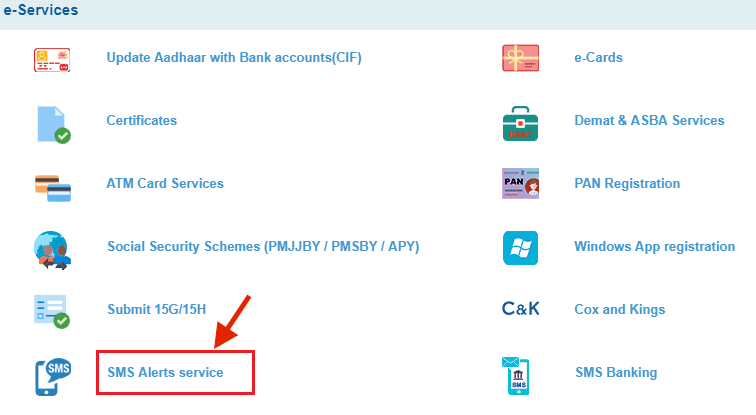 You must know How to Activate or Deactivate SMS alerts through Online SBI. You may require deactivating the services for a particular number and activate for a new number. You don't need to visit the branch and waste your time. Follow the steps without any mistake to activate or deactivate SMS Alerts. Step 1: Visit the official website of State Bank of India and login to your net banking account using the User ID and Password. Click on 'e-services' Tab from the main menu. Step 2: Select 'SMS Alerts Service' option from the list of options. You will get directed to SMS Alerts Registration/Updation page. Step 3: You need to select the Account Number for which you want to activate/deactivate the SMS Alert Services. Click on 'Proceed' button after selecting the account number. 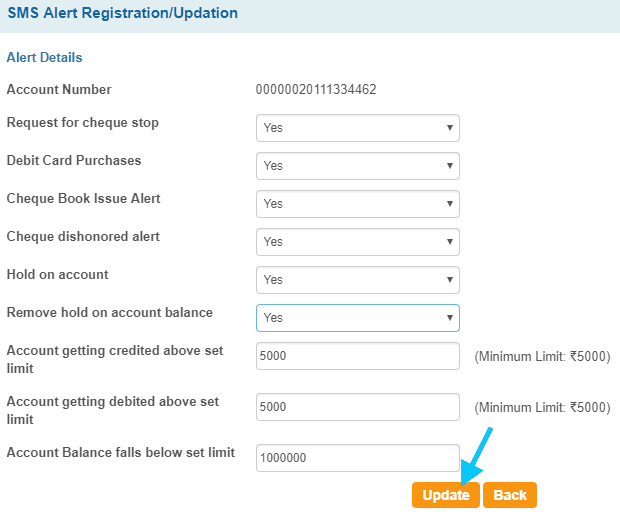 Step 4: On the next page, you will get the details of the services included in the SMS Alerts Service, i.e., Request for cheque stop, Debit Card Purchases, Cheque Book Issue Alert, Cheque Dishonoured Alert, Hold on the account, Remove hold on account balance, etc. You can also set the limit for the account with the options like Account getting credited Above Set limit, account getting debited Above Set limit and account balance falls below the set limit. Click on 'Update' button to proceed ahead. If you want to deactivate the SMS Alert Services, move the mouse cursor to 'To Disable SMS alerts Click Here'. You will receive a confirmation SMS regarding the request and changes made. You need not to visit the branch and waste your time to activate/deactivate the SMS alerts services. Activating the SMS alerts services for your account will be helpful for you in a long run! Activating the services, you can remain updated with your account. How to Get PNB Mini Statement By Missed Call or SMS?